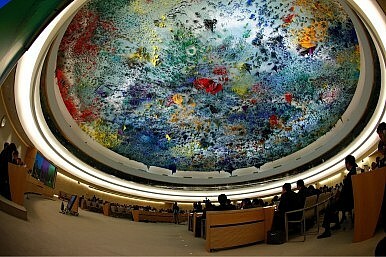 China celebrates its membership of the UN Human Rights Council. Elsewhere, reactions are mixed. Described as a "black day for human rights" and "asking the fox to look after the chickens,” China's recent election to the UN Human Rights Council (alongside Cuba, Saudi Arabia and Russia) has been met with outrage by many concerned groups. However, there are varied human rights interests in China and the impact may be more nuanced; in the fumble for gravitas after the election, the human rights organizations want the voice they've always lacked in China, the UNHRC looks to maintain a sliver of legitimacy, and China … well, China's boasting. Arguably, on the domestic front, China's attitude toward human rights has been, at best, combative, but its spot on the Council could provide some much-needed spotlight. At the moment, however, that spotlight is being used as propaganda. As expected, the state media fawned over China's acceptance; Xinhua, ignoring the protests in the run up to the election and the international outcry afterward, commented, "China's election to the UN Human Rights Council Tuesday also serves as the international community's acknowledgement of China's significant achievements in the field of human rights." Roseann Rife, East Asia research director for Amnesty International, tells The Diplomat, "We are certainly hoping a lot of good can come from it. It really represents a true desire to be more engaged in the work of the council, to demonstrate leadership by example." Over at Human Rights in China, the outlook is perhaps a bit more severe, as they suggest the power China wields and its human rights record is a danger to the council's important work. Sharon Hom, executive director of Human Rights in China says, "The geopolitical and economic influence of powerful member states like China can effectively carry forward or make hollow the Council's mandate that its members 'shall uphold the highest standards in the promotion and protection of human rights.'" Horn adds, "This is not a new risk. This is the world we live in – a world of imperfect global institutions." Adding to his colleague's statement, Ye Shiwei, a senior program officer also with HRIC, tells The Diplomat, "China will be going home to a host of different human rights challenges that it still needs to overcome and still needs to meet the demands of its citizens for reforms." He adds, "Because Chinese citizens are increasingly demanding these rights as well, it will be increasingly difficult for China to say that human rights are only Western constructs." After it was announced that China got the seat, editorials across the land proclaimed that any human rights abuses claimed by the West and rights organizations are mere fanciful political point scoring. As the Global Times put it in its Chinese edition: "Western human rights issues with China are active friction points…Western political discourse and soft power help them to build a 'moral high ground'." China staunchly defends its human rights record – roundly considered dire by international rights organizations – but Rife believes that China fully embraces the concept: "It is something the Chinese government has embraced, so much so that it has put it in the constitution." While some might expect that China will now be made accountable as a member of the council, so far, China is using the opportunity to say that the world recognizes the Middle Kingdom as a bold socialist paradise and that the "Western media" and rights organizations are completely in the wrong and in cahoots. A state media report said on Thursday, "Though China is supported by most UN members…certain Western human rights groups can hardly hide their sour attitude; they just can't resist making rash criticism on China and other developing countries." China's ongoing suspicion and general dismissal of international rights groups is nothing new, and this is something that could affect progress on the Council, as rights groups stress their input is essential. Other human rights organizations – some of which have been lobbying against China on the UNHRC – see the outlook as positively disastrous. Renee Xia of the China Human Rights Defenders says, "China can twist the arms of other member states to vote on important human rights issues…like by offering aid, investment, debt-forgiveness and business opportunities, or threatening to retaliate." But, according to Xia, this is already par for the course in Chinese involvement: "China has been destructive to the Council before – in undermining the UNHRC's independent expert mechanism (Special Procedures), in insisting on language that undermines human rights protection, especially during debates on issues involving internet freedom, freedom of speech, etc." In the past, China has insisted on gradients of human rights by circumstance, something Xia believes "undermines the very core principle of universality of human rights by pitching economic social rights against civil political rights under the name of country-specific circumstances," citing population, culture, lack of development, and security concerns." China’s economic slowdown will have an adverse impact on human rights. In fact, it already is.